One star, its fourth planet, and a lot of buzz. That’s what’s happening as planet-hunters digest the news that European astronomers have detected planet No. 4 orbiting a star with the imaginative moniker: Gliese 581. The new planet has 1.9 times Earth’s mass, making it the tiniest exoplanet astronomers have bagged to date. The golden Easter egg in this hunt, of course, is the elusive Earthlike planet orbiting a star in its habitable zone. There, it’s not too hot and not too cold, but just right for liquid water to gather and persist on the planet’s surface. To spot a planet this small, and use an Earth-based telescope to do it, is a big deal. “This is really the most exciting new discovery in the field of exoplanets,” enthused Debra Fischer, an astronomer at San Francisco State University and an active planet hunter, in an e-mail exchange. It’s an impressive achievement, she continues, in no small part because the planet’s tell-tale signature is tiny compared with larger planets astronomers have found using the same detection technique. The approach detects the presence of a planet through the tiny tug its gravity imparts on its host star. This appears as a periodic wobble in the star’s spectrum. The tool in this case was a sensitive planet-hunting spectrograph called HARPS bolted to the back end of the European Southern Observatory’s 3.6-meter telescope at La Silla, Chile. In the process of nabbing this new planet, the European team also refined estimates of the orbits of three other planets in the system – a revision that pulled a planet with seven times Earth’s mass more securely into Gliese 581’s narrow habitable zone. That planet, Gliese 581d, was discovered in 2007, and orbits the star once every 66.8 days. Gliese 581d “is probably too massive to be made only of rocky material, but we can speculate that it is an icy planet that has migrated closer to the star,” according to Stephane Udry, an astronomer with the University of Geneva’s Geneva Observatory and a member of the research team. This would make it “the first serious water-world candidate,” she noted in a prepared statement. The results were unveiled on Monday at a conference at the University of Hertfordshire in Britain. The work has been submitted to the journal Astronomy & Astophysics for formal publication. You can download a pdf “preprint” of the paper here. Gliese 581 is 20.5 light-years from Earth, in the constellation Libra. As stars go, it’s a munchkin. It has roughly one-third of the sun’s mass and is only about one-third as large as the sun. It’s an M-dwarf star. But by some estimates, M-dwarfs account for 70 percent of the stars in our galaxy. This small size – and ubiquity – makes these stars tempting hunting grounds for astronomers searching for other worlds. 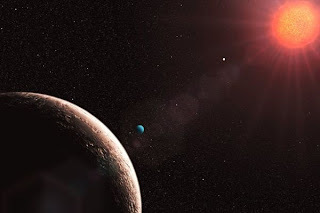 The stars’ smaller mass, and hence weaker gravity, means that any Earth-sized planets will be orbiting an M-dwarf more closely than they might a larger star. In essence, an Earthlike planet’s gravitational tug on an M-dwarf would be more noticeable than it would if a more massive star was involved. That doesn’t mean detection is a cakewalk. It’s just relatively easier than spotting an Earth-size planet around a larger star with a more-distant habitable zone. In the case of the new planet, dubbed Gliese 581e, it’s circling the star once every 3 to 15 days. And it’s doing so at a distance of just under 3 million miles. The researchers say it’s very likely to be a rocky orb. And so close to its star that it would be inhospitable to the max. Or would it? A habitat on the dark side? M-dwarf planets are notorious for launching enormous flares into space, Dr. Fischer explains. Gliese 581e is so close that it’s likely to be locked to the star in such a way that it has a permanent day and permanent night side – no rotation. Especially during flares, the day side would become the fried side. Even without flares, the day side would be bathed in ultraviolet radiation and assaulted by the “wind” of charged particles streaming from Gliese 581. The back side, however, would be shielded from such events. If the planet has a magnetic field, possible given its mass, that field could protect the surface from the star’s charged-particle wind, which would otherwise strip away an atmosphere.